Huge Savings Item! 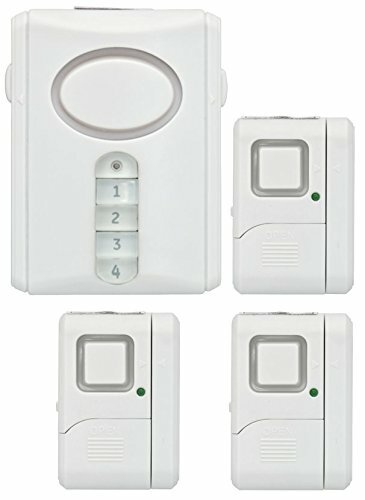 Save 14% on the GE Personal Security Alarm Kit, Includes Deluxe Door Alarm with Keypad Activation and Window/Door Alarms, Easy Installation, DIY Home Protection, Burglar Alert, Magnetic Sensor, Off/Chime/Alarm, 51107 by GE at Elect Forum. MPN: 51107. Hurry! Limited time offer. Offer valid only while supplies last. Complete security kit includes one deluxe door alarm with keypad activation and three independent window/door alarms for added security. Sounds 120 decibel alarm when door or window opens, helps deter intruder and alert residence. Each alarm features three adjustable settings off/chime/alarm. Deluxe door alarm uses four-digit keypad to set security code for arming/disarming. Away mode offers a 45-second exit delay and a 30-second entry, instant alarm when in Home mode. Battery powered, easy and convenient to install, requires no wiring. All mounting hardware included, for indoor use only. Perfect for home, garage, apartment, dorm room, mobile home, RV, office and more.